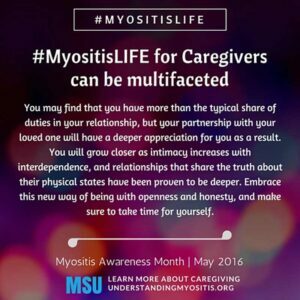 Myositis Awareness Month 2016 Results are in! 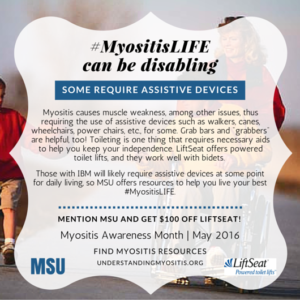 Thanks to YOU, we reached over 187,000 people through our #MyositisLIFE campaign! That is one impressive number, so give yourself a pat on the back! 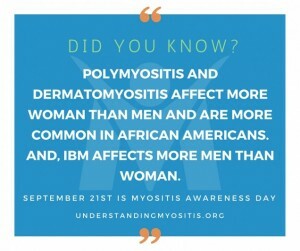 There is always time for awareness through education. 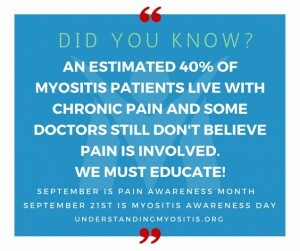 Embrace each opportunity to educate others by providing them with our information cards and brochures. You can order these in our online store to have on hand, or order your very own custom MSU information cards that include your name and information. 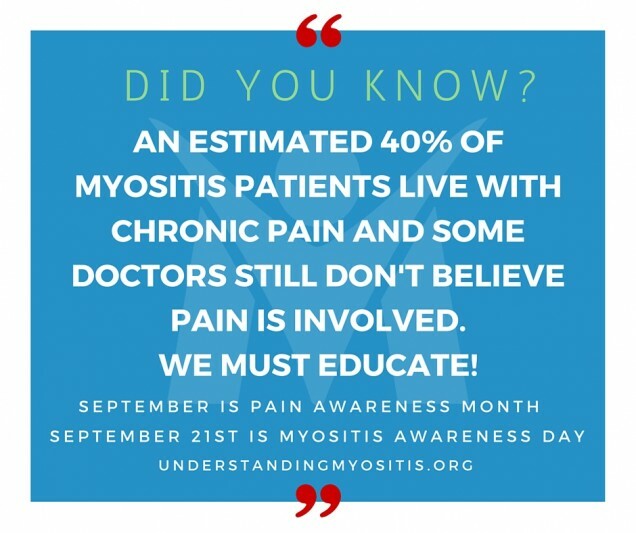 Other ways you can help educate include sharing resources from our website, interacting with and sharing our social networking sites, writing your own personal story to be featured on our website’s blog, and in so many other creative ways. Awareness and Education will help others to better understand our complicated, rare disease. So, when you see an opportunity to educate, we hope you will jump in and take it! 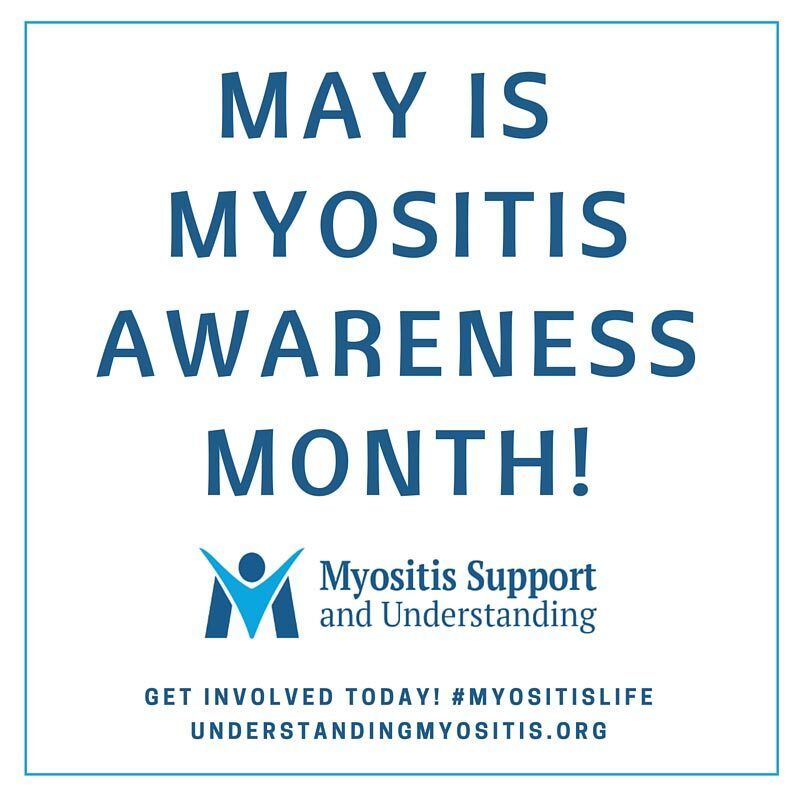 Awareness doesn't end with May! 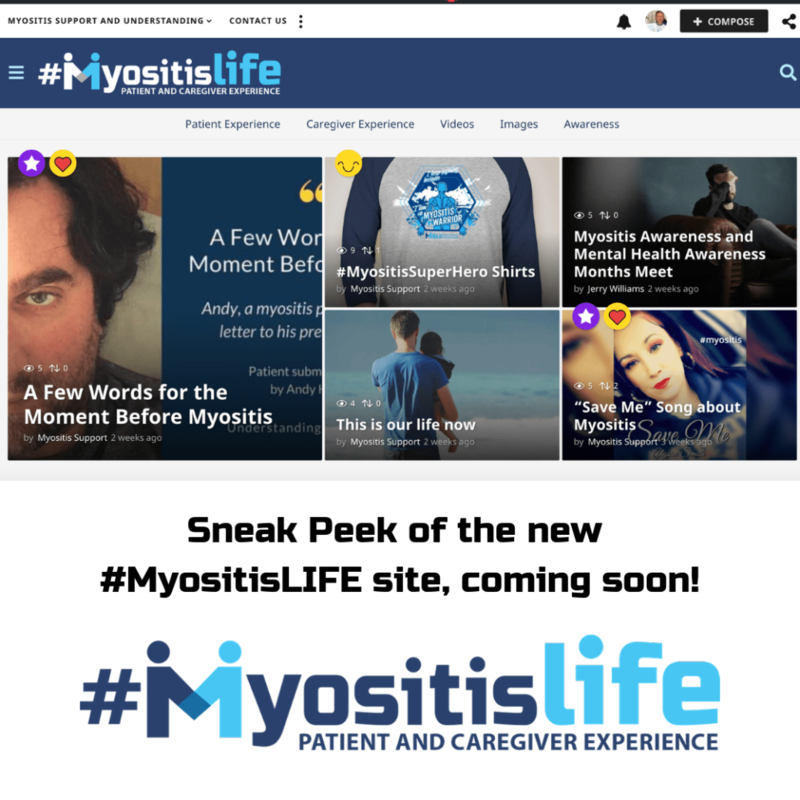 Awareness month may be over, but we still hope you will continue to share your stories and original creations to help others better understand our disease. 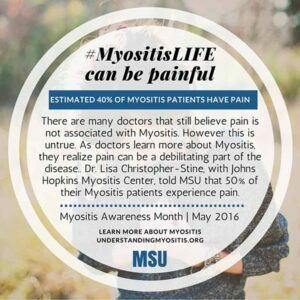 Help MSU show the world that even though we have Myositis, it doesn’t have to control everything about us. This is your chance to shine! 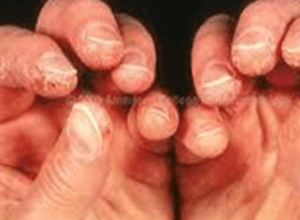 Are you a song writer? An Artist? A poet? Do you have photos of your kids and pets you want to share with us? Does your family want to make a video talking about some obstacles you have overcome, as a family? Do you want to tell us about your favorite vacation? Take us on a tour of your favorite park? Show us your backyard where you relax? We want to see and hear about your life! We hold regularly scheduled video chat support sessions monthly. 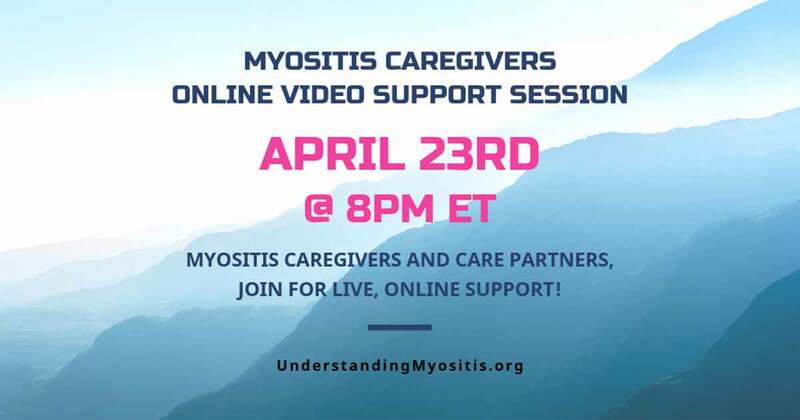 Video Chat Sessions include: disease-specific chats, Laughter Yoga, and special guests to inform you! Each session has something you can learn and they are free, fun, and informative. You will be a part of the conversation and, you can even make new friends! 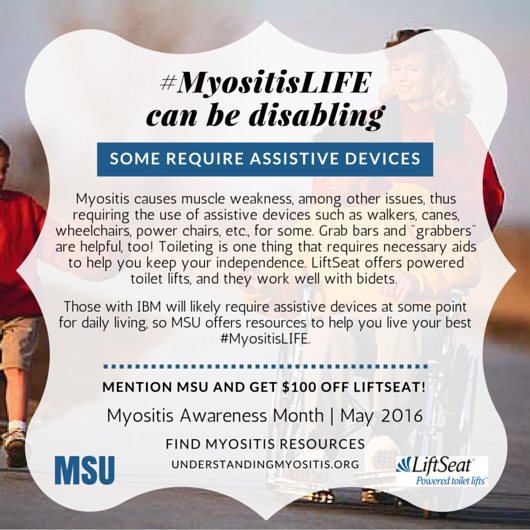 Host a fundraiser in your city, state, or even small town and donate the proceeds to MSU. We will help you plan and provide you with materials for the event. A great example is a 5K! Contact us today to let us know what you can do! As a completely volunteer-managed nonprofit organization, we are always looking for passionate and enthusiastic volunteers! Sign up today and we will be happy to work with you to find things you are able to do from home. 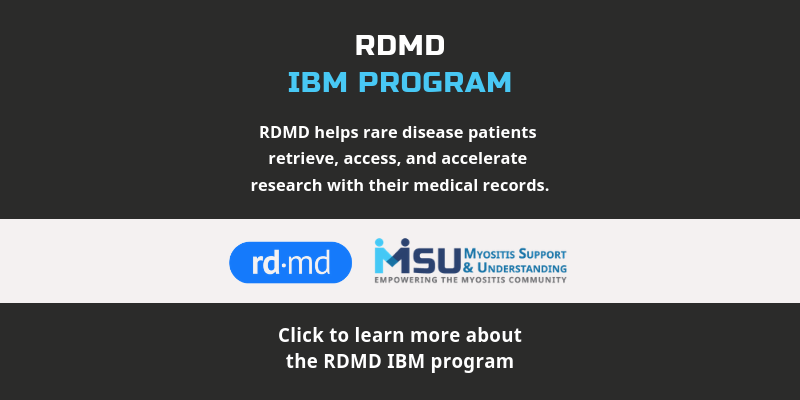 Help us continue our work to educate patients, caregivers, family members, friends, and healthcare providers, and to move forward with our goal of providing need-based financial assistance for patients. 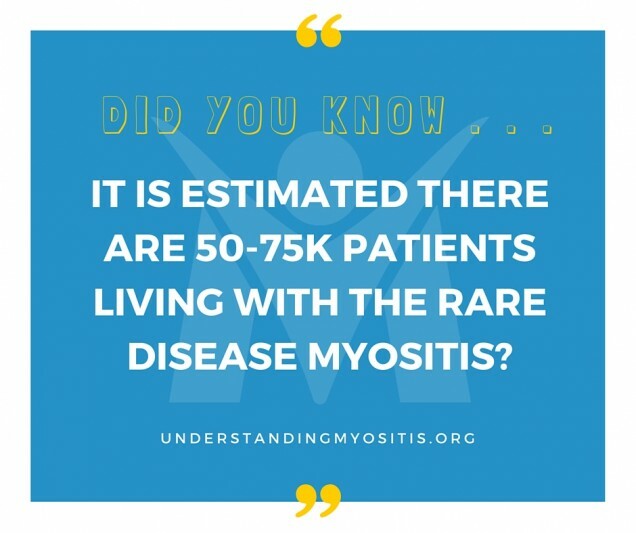 As part of our #MyositisLIFE campaign, will you Go Fund us at www.gofundme.com/myositis or you can make your donation direct on our website here. Donating to MSU is a wise investment. 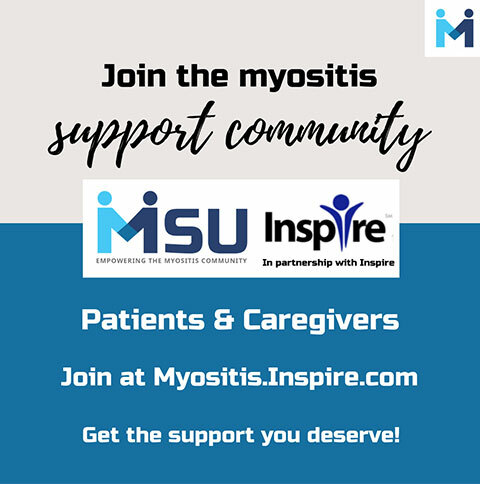 We were founded by Myositis patients, for Myositis patients and we are committed to you. 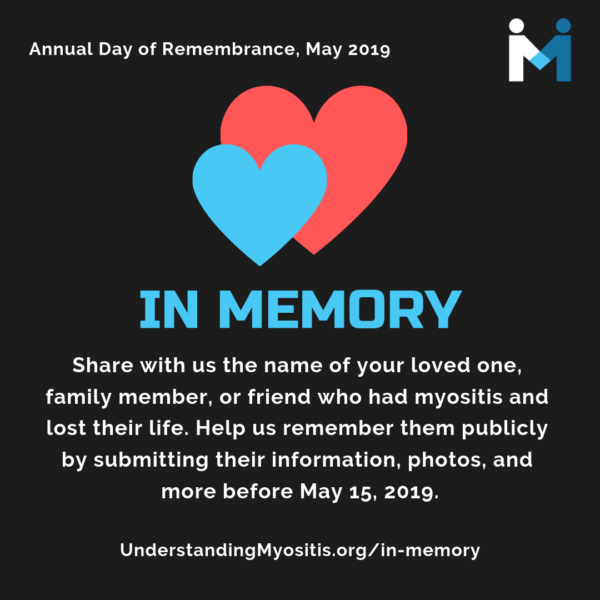 Tell them your story and connection to Myositis. 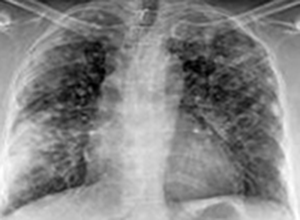 Explain your disease and why it’s crucial that others know about it. 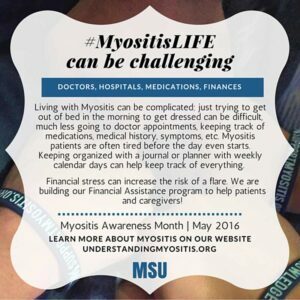 Inform them about MSU and let them know why donations are important. A house party is an event, held in your home, to which you invite people you know. It can be a morning brunch, an afternoon tea, or an evening wine and cheese gathering. Light refreshments are served, and at some point during the event, someone talks to the gathering about MSU and Myositis. Learn how to host a house party quickly and easily. 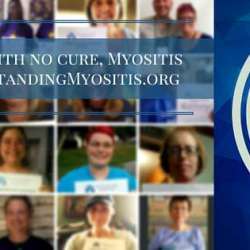 Our Myositis Information cards and brochures which include our contact information, our mission, and an explanation of Myositis. 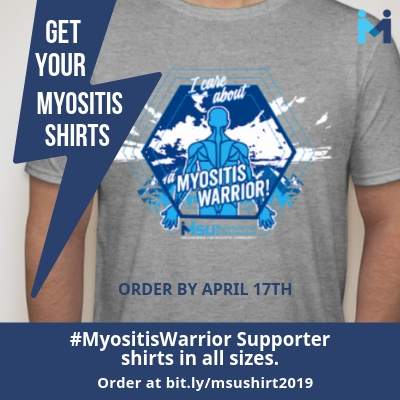 Order today and make a tax-deductible donation! Join and Follow us on our social networks. 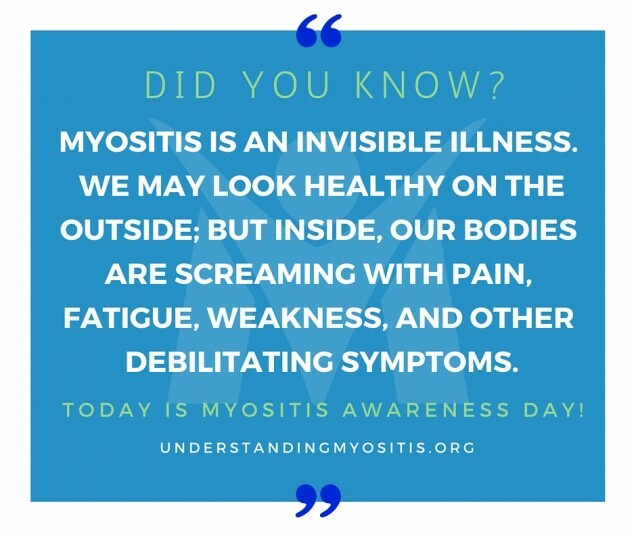 Share our posts and updates to help keep your friends and family members involved. Subscribe to our email updates and newsletter to receive notifications, specials offers, new program updates, and much more. Subscribe today! In just 2 hours, you can start off your colleagues’ day by providing a simple breakfast of bagels/muffins and juice, have a brown bag luncheon where you provide dessert, or step out for a lunchtime walk with your colleagues. At each of these, you can educate your co-workers about Myositis and why you support MSU. Let them know why supporting us makes a difference. 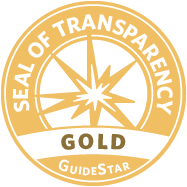 We write our our own articles using fact-based information and reliable sources to help educate our members and friends. Take some time to read the over and post your comments to help each article receive more attention. 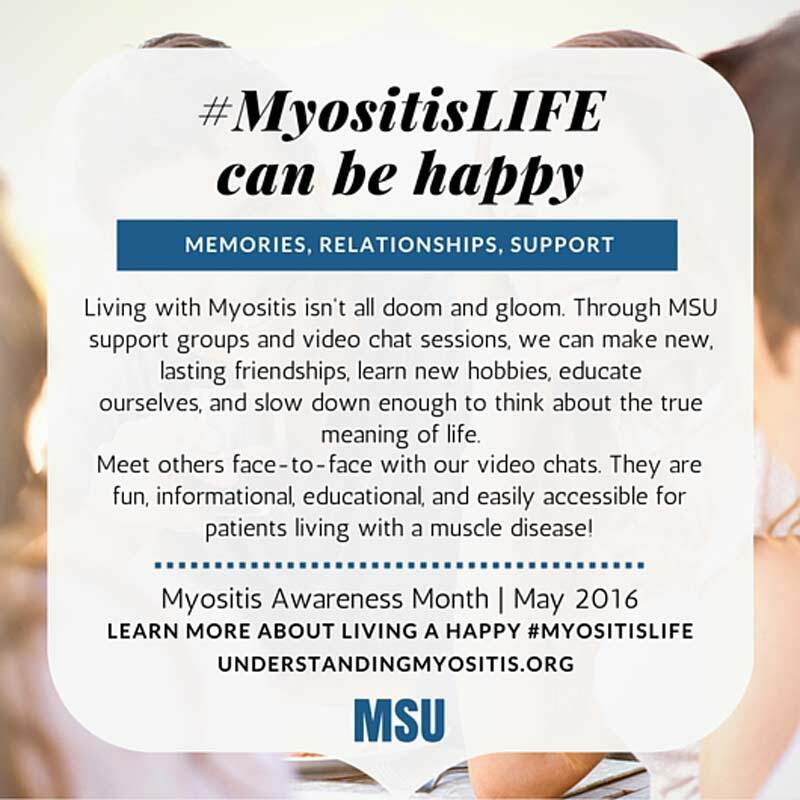 Our Facebook page is used to help educate patients, friends, family members, and anyone wishing to know more about Myositis and what MSU is doing. Like our page! 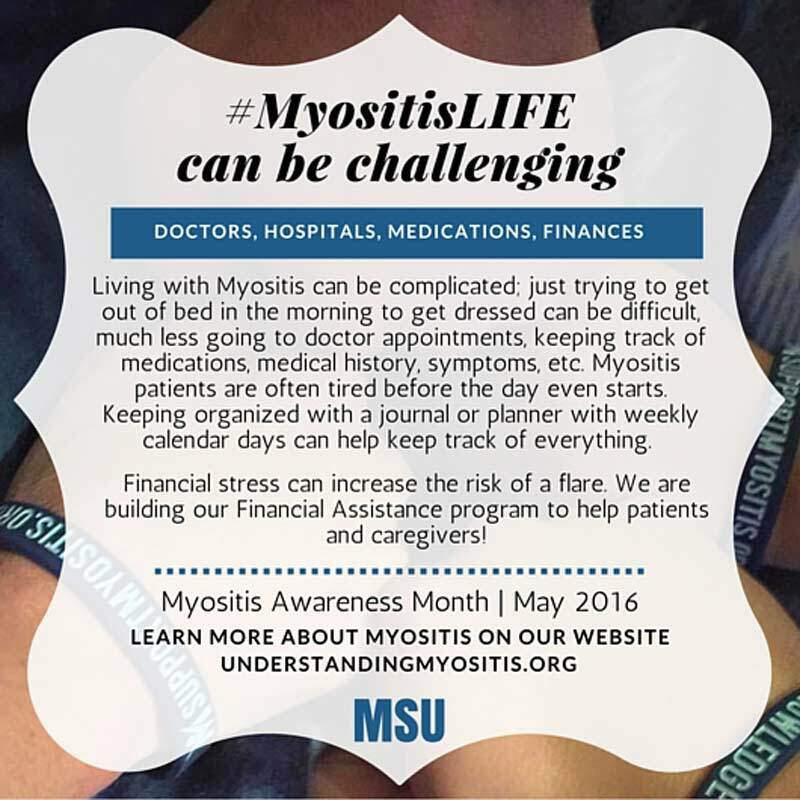 Help support Myositis Awareness and MSU by purchasing Myositis wristbands, pens, apparel, drinkware, and information cards in our online shop. On Twitter? So are we! 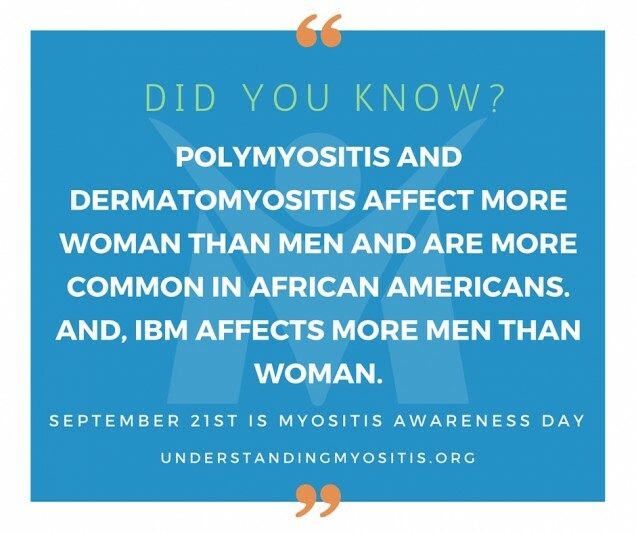 Share some information just by clicking on the messages below! 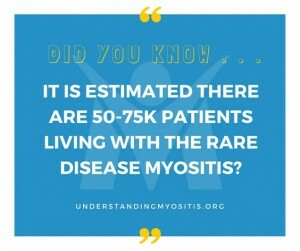 Still time to make a donation! 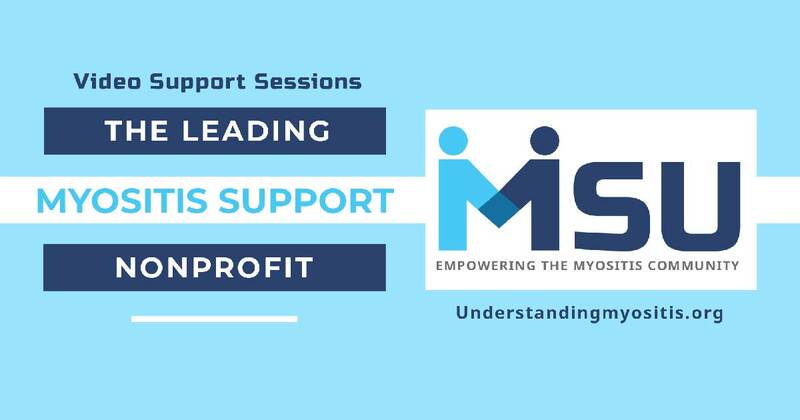 As a nonprofit, MSU has a responsibility to fundraise in order for us to continue moving towards our mission and goals. Will you help by making a donation of any amount? 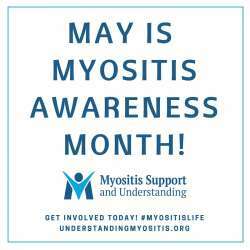 Want to reach out to your family members and friends to get them involved in Myositis Awareness? We have put together a document you can use to email them, or take bits and pieces to share on your social networking sites for them to see. 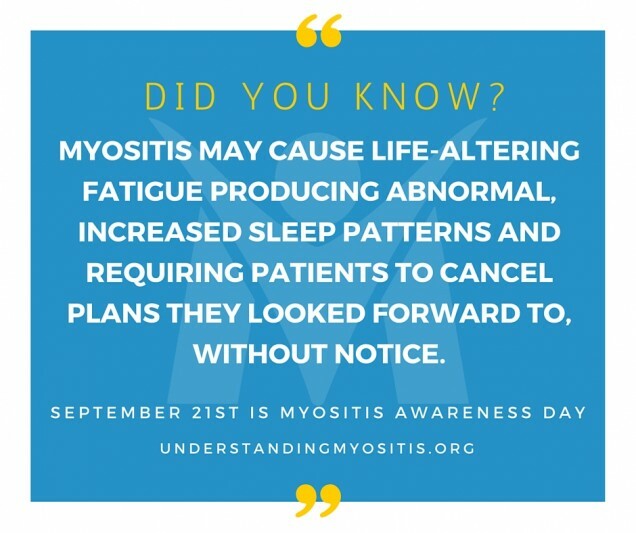 Either way, you will be taking direct action and advocating for better understanding and support of an organization that is helping patients day-by-day! Click the button below for a Word format you can use to edit and then copy and paste. 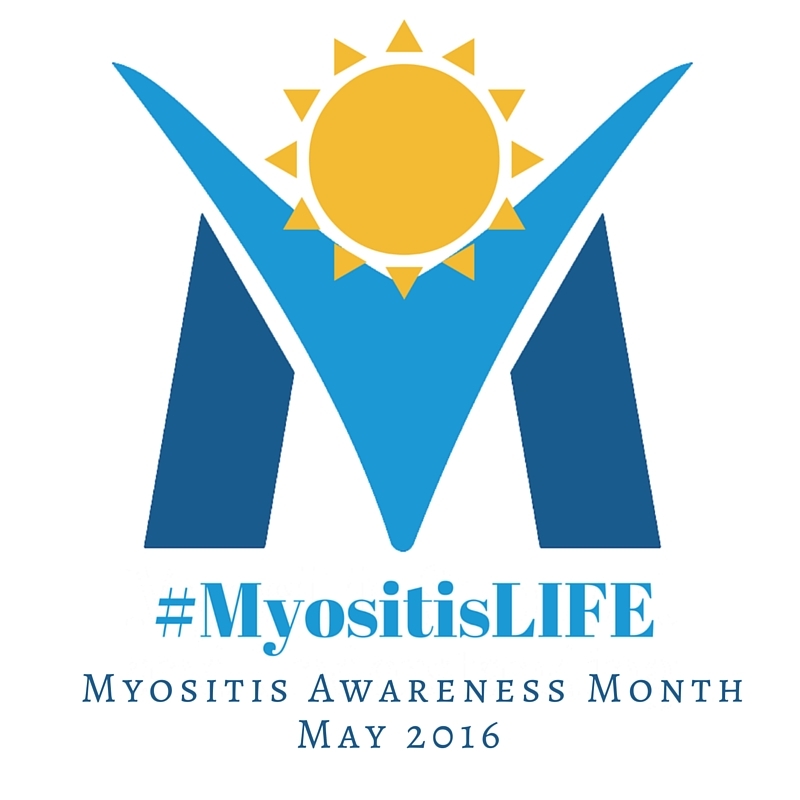 Show your Myositis Awareness Month support by changing your social networking profile photos. 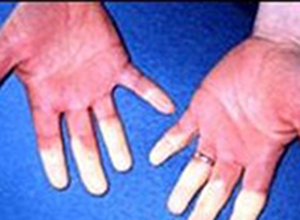 The images below can be downloaded to your computer and uploaded to the social network of your choice. 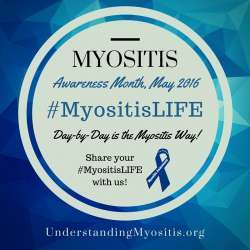 Make a commitment today to show the world what Myositis looks like! 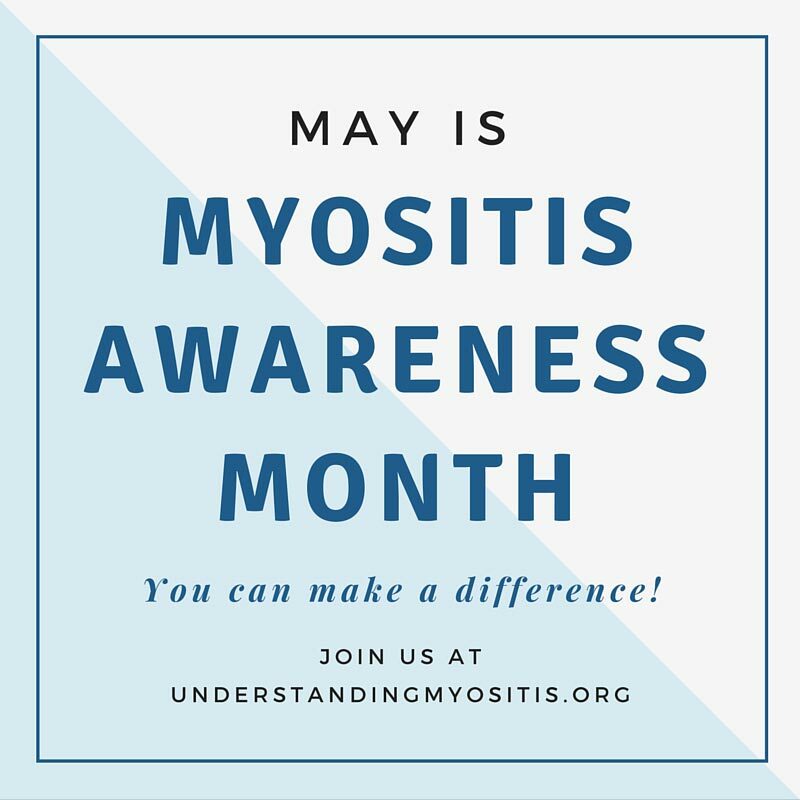 We have put together a double-sided flyer that includes information about Myositis, and its subtypes of Polymyositis, Dermatomyositis, and Inclusion Body Myositis, as well as information about pain and fatigue. 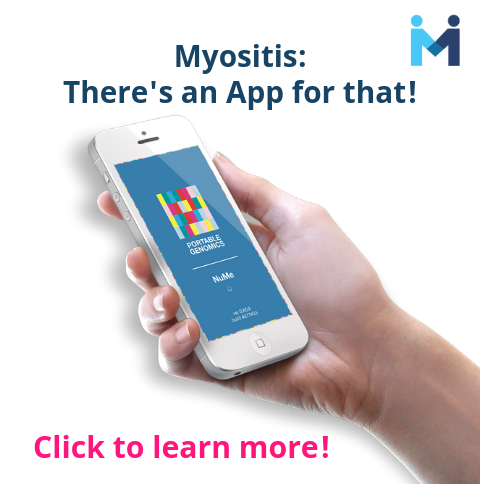 Download and share to help educate others. 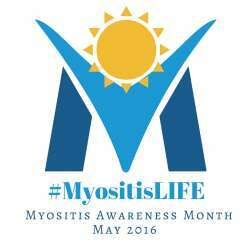 #MyositisLIFE can be . 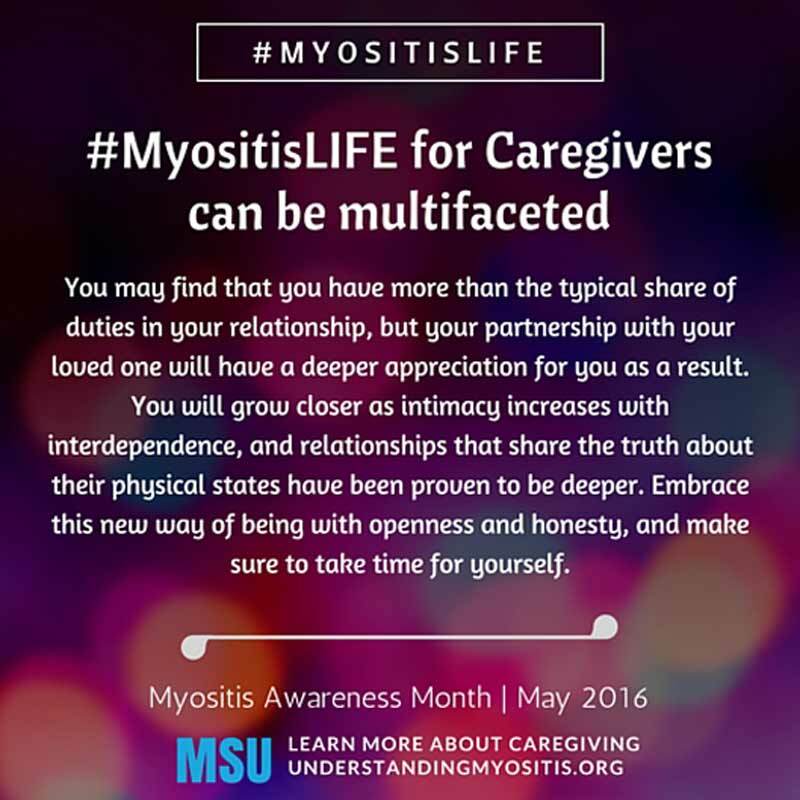 . .
#MyositisLIFE can be many things. 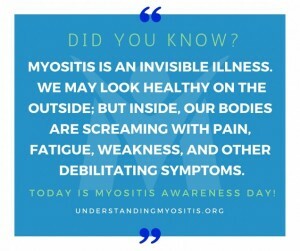 It can be challenging, beautiful, invisible, full of meaning, painful, and so much more. 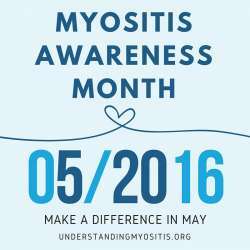 Share these educational images to help your family members and friends learn a little bit more about Myositis. 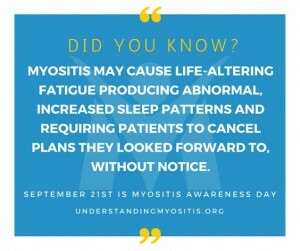 We will be adding more throughout Awareness Month! 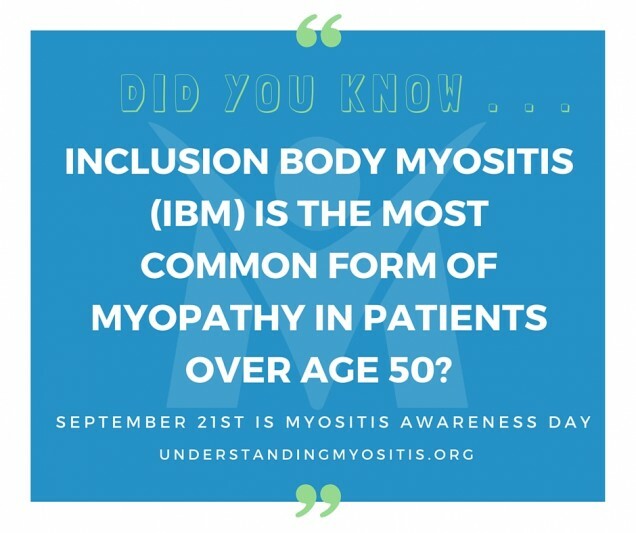 This is a video creation based on a sign campaign we did for Myositis Awareness Day 2015. Does this video make you want to become more involved? We would love that! 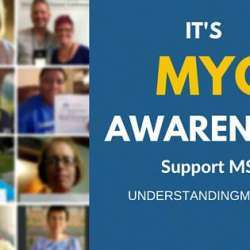 We have volunteer opportunities, and you can also purchase awareness products, or make a donation, to help MSU promote education and patient financial assistance. Or, host an event in your town or city! 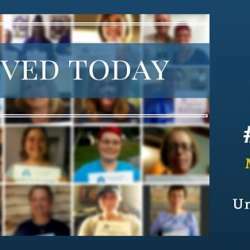 2015 Thunderclap Results: We did it! Goal was to surpass 2014’s 52K social reach and we did! Our Thunderclap message was a huge success reaching 78,722 people across social networks, spreading an awareness message. We surpassed our 2014 goal by 27,483 new social messages. Thunderclap is the first crowd-speaking platform that helps people be heard by saying something together. The way it works is by you signing up and then once a goal is met, Thunderclap shares our message to everyone in your social network! 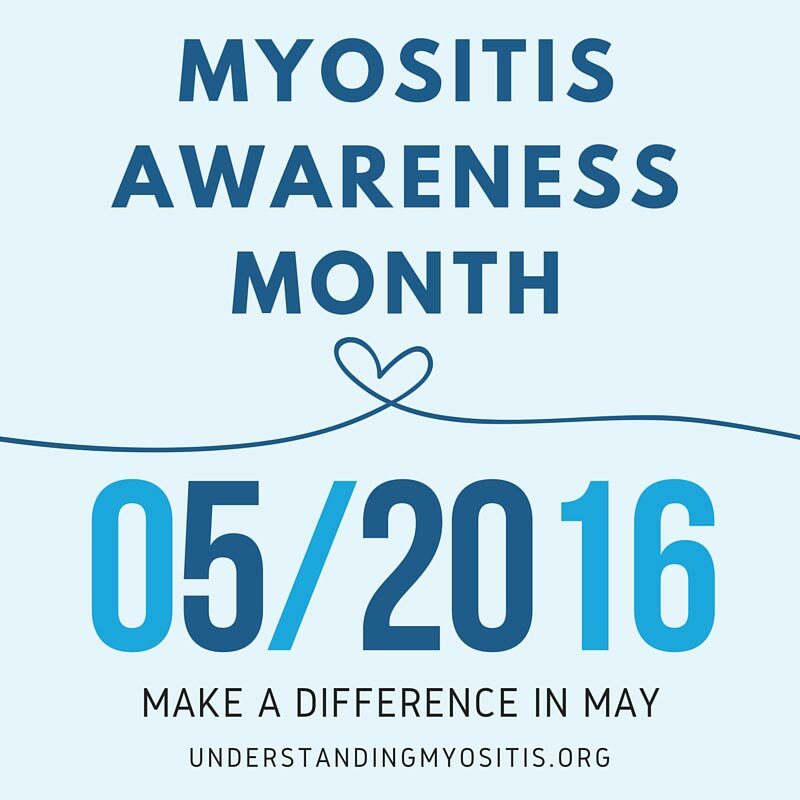 Stay tuned for the 2016 Myositis Awareness Month Thunderclap message! 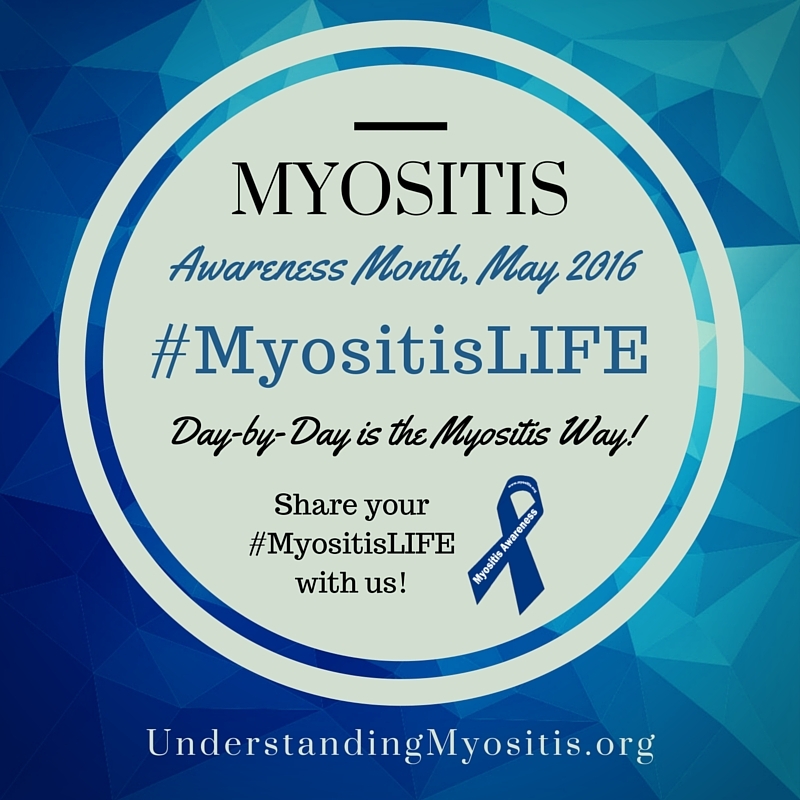 For 7 days leading up to Myositis Awareness Day, we shared several educational graphics. 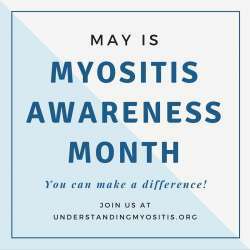 These important “tips” are excellent to help your friends and family members to understand a little more about Myositis and how it affects our daily lives. Below are the ones we shared. Feel free to save them and continue to share them with your friends and family all year long. Educate others with these fact-based graphics! To download, click the button below to save as a zip file.